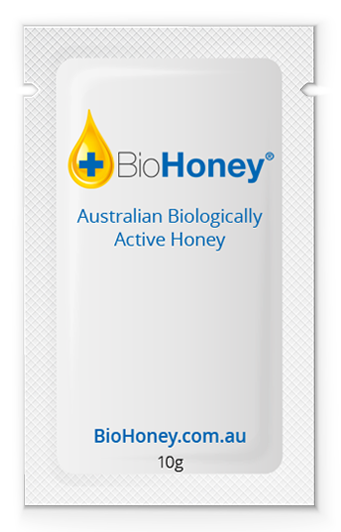 Biohoney is a pure Australian natural product of honeybees which has biological qualities useful for wound healing . Australian and New Zealand plants have nectars which contain biologically active enzymes and substances which can kill MRSA and VRSA in wounds . In Australia and new Zealand these plants are manuka , jarrah, leptospermum, ( includes Ti tree , Tea tree , leptospermum scoparium & others). This is the type of honey that is distilled by honeybees into Biohoney. 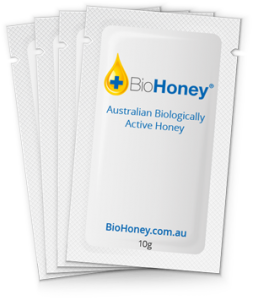 Biohoney is packaged in Australia in individual sachets to be easy to use by nursing staff or home carers. It is not subjected to temperatures over 40’C to enable the enzymes which come from the bees themselves to continue to work. In fact in the Australian bush where refrigeration can be difficult for antibiotics – honey will continue to be effective in those areas. If you are in a country where being cold is a problem , the honey can crystallise . This is normal and that’s why Biohoney comes in a sachet which you can warm between your hands. Biohoney is from honey producers in eastern Australia but there are New Zealand and Western Australian products which can also act similarly. Australian honey is the purest in the world at present , as we are the only country which does not have Varroa mite, so we use very little chemicals in our beehives. This particular honey comes from rural eucalyptus forest and leptospermum in a national park so does not contain pesticides. It is also irradiated to prevent transmission of bacterial spores. Please read the information pages for how honey works on wounds and bacteria , on this website . Please also be very aware that if a wound is not healing you should see your health professional within 2 weeks. Biohoney will not cure cancer, but honeys can decrease the smell of inoperable skin cancers, allowing people to participate in life without smelling horrible. Biohoney will not fix asthma: if you or your children are coughing or breathless , see a health professional. If you have any questions about honey and wounds, please contact us.